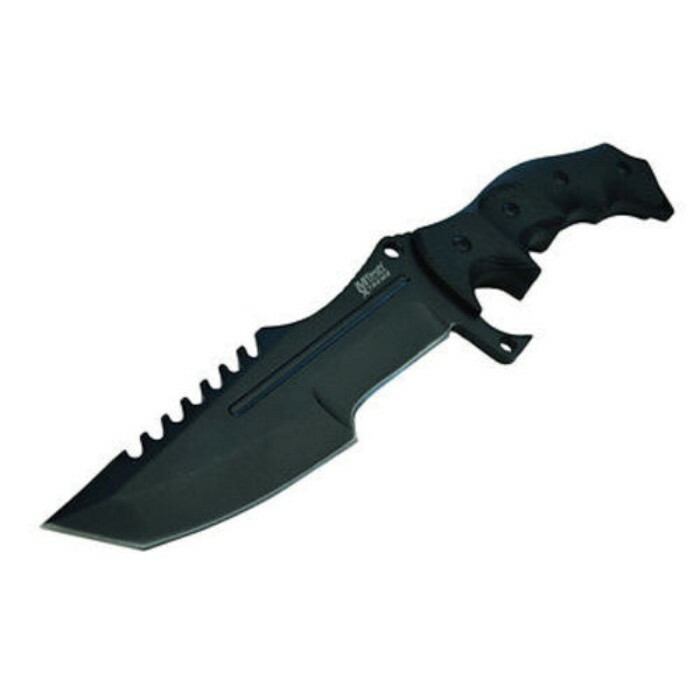 Huntsman Tactical Fixed Blade Knife With Sheath | BUDK.com - Knives & Swords At The Lowest Prices! 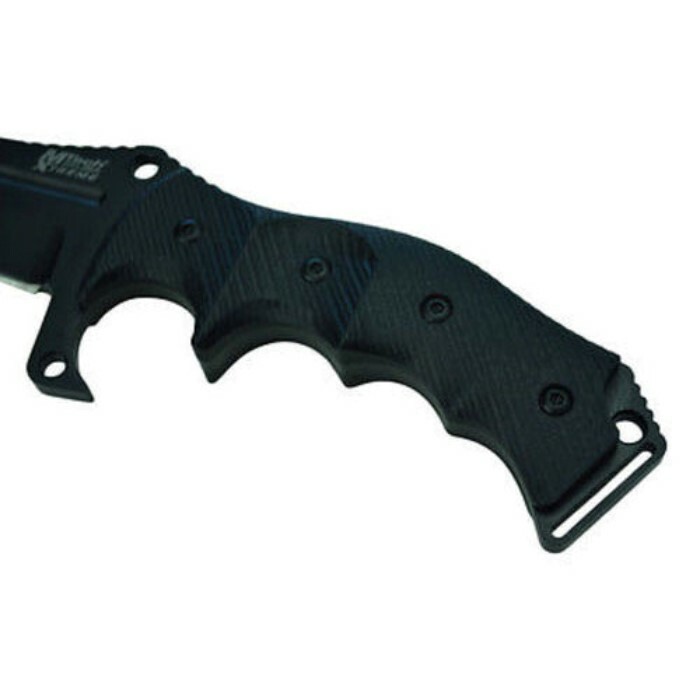 New from MTech, thisreproduction of the Huntsman Knife is one heavy-duty get-it-done tool. If you really want a working knife that you can depend on, then stop right here! The black tanto blade is 5 1/2" of rust-resistant stainless steel. 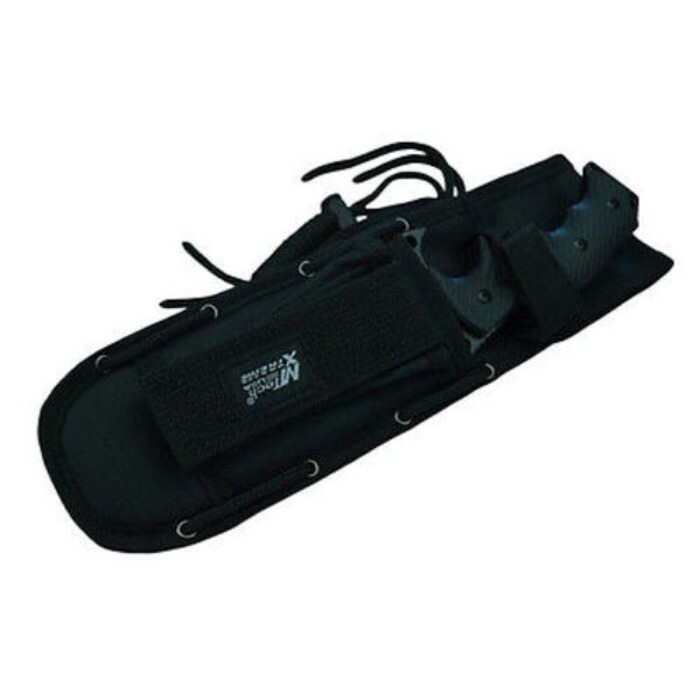 A G10 handle gives you a slip-free secure grip and it has a lanyard hole. A sturdy nylon sheath completes the package. This is a truly great knife. It’s sturdy, well balanced, comfortable in either standard or reverse grip, and it comes razor sharp right out of the box. The blade retains it’s edge well through most any job, and, when it does grow dull, it is easy to resharpen and hone. Easily one of my favorite EDCs. I was very uncertain about wether or not I had made a good choice in purchasing this knife considering the price and that it was my first knife made by M-tech. However, as soon as I opened this knife and got to actually hold it and inspect it, I was beyond confident that I had made a great choice. This knife far exceeds my expectations! Overall, it is a multi functional BEAST! I was also equally impressed with the sheath and it's multi functional capabilities too. This is a top shelf knife priced at half it's worth, in my opinion. I highly recommend this knife to anyone looking for a great value on an awesome knife. Got this knife for my brother for Xmas. I like it. Good blade for the money. Had to sharpen it, but then again, my standard of an proper edge on a weapon is pretty high. Wish I would of ordered two, one for myself. i was excited about this knife and it has done me well in the past three weeks ive owned it. havent done anything more than clear brush but for a combat knife it hacks fairly well and is durable. only downside to me was the grip i would much prefer a more versitile grip which i can hold in any way. This is my favorite knife so far heavy duty nice sheath and lanyard with it love the look of and feel of it in your hand. Would pay a lot more for this knife if it would have been. Easily 100$ or more if they were asking for it in my opinion real sturdy feels like it would hold up great. This knife is very well made, blade is super sharp and amazingly well balanced. The only this, it's huge, about the size of your forearm. Don't be fooled by the fact that it is in the pocket knife category. Still a great buy though. 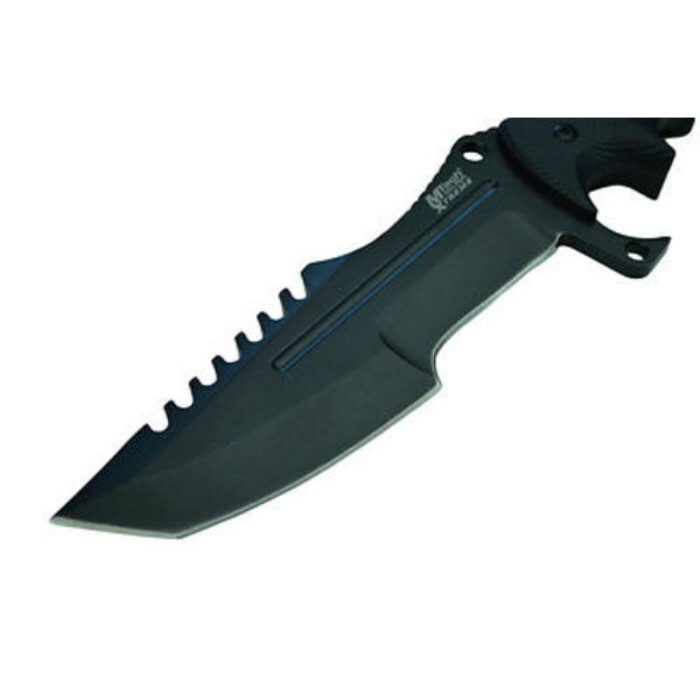 This is a full-tang combat/survival knife with an odd design that makes it ideal for hacking/slashing. It's got a thick but light and strong blade. Its sawteeth are actually functional (although I prefer conventional saws because they're more effective). The grip is nice and has a guard and lanyard holes. If you have paracord, you can wrap the knife around your hand for ensured no-slip. Not that the knife is going to slide or slip out of your hand with the grip it has, but if you are hacking with it, it is more secure. 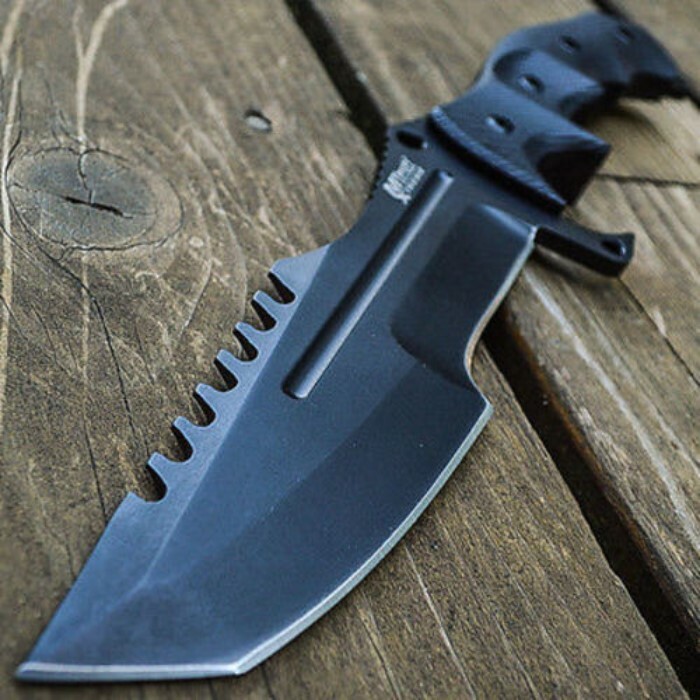 Overall it's a wonderful knife that is the "Huntsman" design from Counter Strike: Global Offensive, only this physical version is a lot less expensive than its virtual counterpart. It's also the knife from Call of Duty Ghosts, and Halo 4 and 5, so the design has been popularized. Stattrak not included.